While head and posture control are essential in Jiu Jitsu, taking care of your partner’s is more important. This article talk’s a lot about turning and pulling heads. Make sure to warm up well, talk to your partners about what you are working on, and as always don’t use full force to smash your partner. Take care of your partners, and you can definitely still utilize this awesome information! I don’t know how many times my professor has reminded me about keeping good posture. Sitting up straight, or keeping my spine in a straight line is crucial for Jiu Jitsu. It is easy to hear these reminders, and even easier to forget them it seems. The fact that helps me remember it the most though, is when I use that exact idea against my opponents. Once I get head control, they don’t get a choice but to look the way I want them to. Keeping good head control is what keeps me mobile and them stuck. So why is it so important to keep good head control of an opponent? It can be broken down into three basic ideas: Power, Mobility, and Sense. I think we’ve all heard these words before, and most have heard them in context to Jiu Jitsu. With that, the idea of head control gets very understandable. So let’s dissect these ideas even further, to get the thought stuck in your head. For the ideas I am giving, I will be coming back to two scenarios that help explain each while circling back to how they intertwine: Side control, and a single leg takedown. When in the bottom of side control, it is crucial to keep your opponent from under hooking your head. If they get their arm there, it becomes much harder to escape. Dealing with the weight of them plus their squeeze is a big part of this, but the biggest reason it’s a bad idea to get underhooked lies in your posture. Trying to hip out and away from an opponent in side control is hard enough, but when they turn your head to face away from their body you lose quite a bit of strength. When your spine is out of alignment (not straight) your entire body is affected by it. Your legs and arms lose the capacity to push as much, and your core can’t curl as hard or bunch into a good side control defense. So when you get the top of side control, remember this detail. If you can keep your opponent from turning into you, you can prevent the basic escapes and lower their ability to push you off. This doesn’t mean crank all your training partner’s necks, but even forcing them to only look straight up instead of towards you can make a huge difference in their basic defenses. Now say you’re attempting a single leg take down, once you get ahold of your opponents leg they start shoving your head down into the mat. If they push at the right spot it seems impossible to fight, and your strength in the take down dies quickly. The same thing is noticeable when in a clinch situation before the shot. If you pull on the back of your opponents head compared to their neck, you can watch them bend down. At this point they are much more pliable and easy to yank down. Along with strength, when you keep your opponents spine turned slightly they lose quite a bit of their mobility. Back in the bottom of side control, if you are looking far to your left it feels almost impossible to turn your body to the right in order to frame against your opponent. Even reaching across with your left arm is much harder, because where your head is facing your body wants to follow. While you are in a single leg position and your opponent gets an arm under your head, it can be hard to get lower down for the take down. If they force you to look up high, your body won’t want to drive forward and down. Also, in the clinch position you can lose your ability to shuffle correctly or take the right steps if your opponent is pulling your head to the side and down. In fact, you can simply force your opponent to step where you want by controlling their head well. Practice making your partner step by using good head control and twisting them into position. Their body will follow their head and force them into a large step, giving you an easy takedown. Sensing what pass, submission, or takedown your opponent is going for is key in preventing it or utilizing it for your gain. It can be much harder to feel where your opponent is going if your neck is twisted to the side and your body is only thinking to follow the neck’s position. 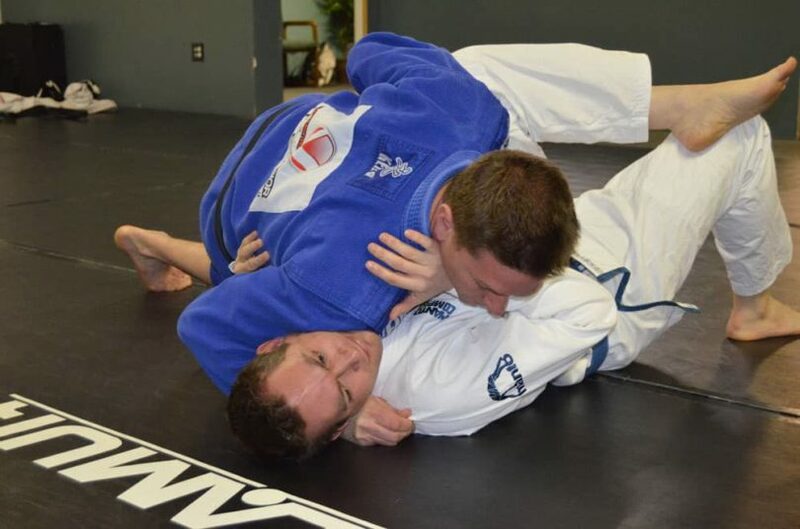 In side control, if you can’t see that your opponent is grabbing for an armbar it becomes crucial to feel it. While not having to watch what is happening is Jiu Jitsu 101, having a good head control can keep your mind on getting good posture again instead of the dangers of limbs or of getting mounted. Also, if you are attempting a take down, if you can divert your opponent into looking towards their back leg, the angle for a single leg opens right up to you. To divert your opponent’s head all you need is a good pull or swivel. If they can’t see what’s going on they can’t defend it as well for that split second, giving you a take down and top position. As I said before, this information is sweet, but taking care of your training partners is sweeter. Don’t injure each other in the sake of doing something cool, or getting mount. I hope this stuff helps you in controlling and scoring at your next comp, see you on the mats!